Writer Zach Savich: When I read that poem, I see a dark road. It looks wet because of headlights, not rain. Artist Elizabeth Terhune: I liked the gathering of images. I’m always thinking in terms of visual interpretation. The poem has a straight-forward, direct quality. The language seems plain, quiet actually. Yet it navigates through a difficult experience. So it seemed contrary—the sensitivity of the narrator and yet his ease with leaving—and that stuck with me. Writer Zach Savich: Meghan Keane animated the sentences—rippling. I like the thing being born in the middle, already tethered. Elizabeth Terhune showed me the situation as simultaneously airy residue and posed solidity, lyric gasp and narrative oomph. In hers, I can see the central arm as coming from either figure, then I look closer—it is clear whose arm that is. This happens to me all of the time and is in the poem and it breaks my heart. Artist Elizabeth Terhune: I think my image may be a little more watery-looking than I’d thought. Writer Zach Savich: I have trouble thinking about all three things at once, of even actually considering words and image at the same time except by relying on overall effect, lasting impression. Maybe this is what the Broadsided project foregrounds? How one aspect flavors the other, not by putting them in the same bite but by making me alternately (or alternatingly) treat one as a memory, an impression, and the other as perception, even as I try to understand them in a flash? Artist Elizabeth Terhune: I liked the way Meghan refused a more direct representation and focused instead on the agitation of the back and forth of a breakup, and her reference to the 30 whumps. Artist Elizabeth Terhune: We both responded to the way the poem contains a meditation on time. We both included a visual equivalent of motion. Turing and turning away. Writer Zach Savich: There was one month in Paris when I wrote in museums, dutifully studying representation, then I felt solipsistic. I like Cole Swensen’s idea that ekphrasis can teach a way of looking, of attending to patterns and sight, that one can then apply to gardens and people and city streets. I frequently read about sculpture and architecture to help me think about poetry, but that’s reading. Artist Elizabeth Terhune: Right from the start I was making trial images that involved a bear and that also included the woman. I understood the two as connected. Both beings are relating/related to isolation—an experience not required of the narrator. Because of this connection, initially I used doubling, which grew into using multiples. If you had to represent the Broadsided of “As Any…” with Meghan Keane’s art by one word, what would it be? Artist Elizabeth Terhune: Again, not sure I can answer this. Spiraling. 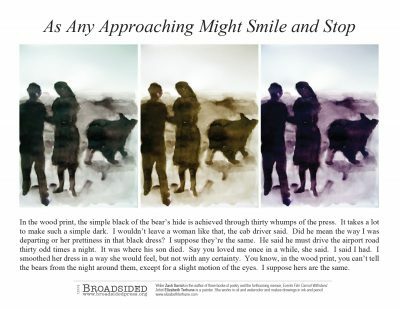 If you had to represent the Broadsided of “As Any…” with Elizabeth Terhune’s art by one word, what would it be? Artist Elizabeth Terhune: I’m not sure I can answer. Unravelling. Writer Zach Savich: I woke up early this morning to finish the last hundred pages of Stanley Crawford’s Mayordomo, a memoir of irrigation and garlic farming in northern New Mexico; highly recommended. Tonight I am going to read from the new Gulf Coast, Lisa Robertson’s R’s Boat, and a little Hawthorne. Artist Elizabeth Terhune: The Darkroom of Damocles by Willem Frederik Hermans, The Passport by Herta Müller, Edith Wharton’s The House of MIrth and Wolf Hall by Hilary Mantel. Writer Zach Savich: Yesterday I saw a man hit the side of a parked truck with a baseball bat. I was in my car. I tried to make my eyes dead as I passed. I think I was differently disturbed than if I had seen him hit a person. There was no one else around. Maybe it was his truck. Later I tried to make my eyes lively and receptive as I walked around a local reservoir. There were some teens posing for a photography project. One threw leaves in the second one’s face while the third took a picture. They had a circular silver screen to help position the sun. I made my eyes lively yet uninviting, hoping they wouldn’t ask me to help them stage the photograph. These Broadsided images make me think of my poem like those teens will think of that photograph when they find it in several years. It may represent all of photography to them more than any camera, technique, or lesson from this year’s class. Is that sad or true, I wonder, then I wonder if it is about memory or art. A while ago, I really enjoyed Emily Eveleth’s monumentally grand paintings of jelly doughnuts at the Smith College Museum of Art. Artist Elizabeth Terhune: Thomas Noskowski at Pace Gallery. Albert York at Davis & Langdale Co. Artist Elizabeth Terhune: I appreciate how a poem changes when you read and reread it. It is always interesting to work through this process. And, a thank you to the Broadsided team. Without whom . . . Writer Zach Savich is the author of three full-length collections of poetry—Full Catastrophe Living, Annulments, and The Firestorm forthcoming from Cleveland State University Poetry Center—as well as a lyric memoir, Events Film Cannot Withstand, that is forthcoming from Rescue Press. Artist Elizabeth Terhune has exhibited widely throughout the United States. Her most recent shows include a two-person show at Feast Gallery in Saratoga Springs, NY, a four-person show at Metaphor Contemporary Art in Brooklyn, NY, and a one-person exhibition at the Lake George Arts Project, Lake George, NY. You can view some of her work online at www.elizabethterhune.com. She teaches painting and drawing at the 92nd Street Y and at NYU’s School of Continuing and Professional Studies in New York City.